“How the other half lives.” We hear this phrase all of the time, but what does it mean? Well, I had a rare opportunity to find out how those with a taste for luxury spend their vacation time at Disneyland Resort’s flagship hotel, the Grand Californian Hotel and Spa. 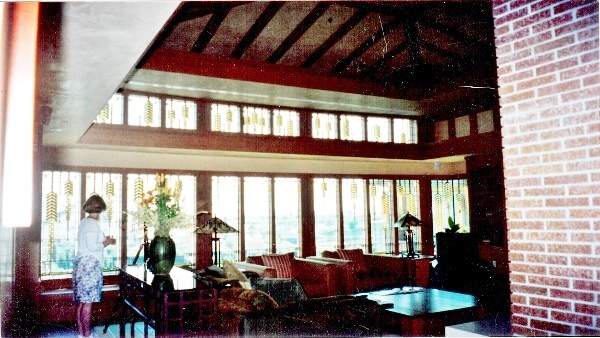 Ten years ago, when the Grand first opened in 2001, I had a chance to tour their “Vice-Presidential Suite” – the Frank Lloyd Wright themed Arcadia Suite. Located on the 6th floor, above Storyteller’s Cafe and overlooking the Redwood Pool, is a masterpiece of Arts and Crafts Architecture. I was rummaging through a pile of memories and found these old photos. I thought I’d scan them in and share them with you. The Arcadia Suite is one of two suites in the Grand Californian, whose architectural theming is primarily based upon Frank Lloyd Wright’s design ethic of his earlier Illinois career. Arts and Crafts architecture geeks, like me, will find the room fascinating. It honors the Arts and Crafts theming of the Grand Californian quite well. Not only an elegantly comfortable room for VIP guests of the resort, it is marketed to meeting planners as a suite for use as a base of operations. It surprisingly has room enough to entertain up to 50 guests for a cocktail soiree. You enter the suite through double doors at the north side of the room and emerge from behind the brick fireplace into the living room. The room is awash with light from the custom stained glass windows bearing Frank Lloyd Wright’s signature Tree of Life pattern – a theme repeated throughout the suite. Your south-facing view is comprised of not only the entire resort pool complex, but also the whole of California Adventure park. There is no balcony on the outer side of the stained glass windows – that would obstruct the magnificent view. Instead, both the dining room and king bedroom open onto small private balconies, similar to those in the standard rooms. Standing by the windows, looking back toward the entry area, you get a better glimpse of both the fireplace and the furnishings. F.L. 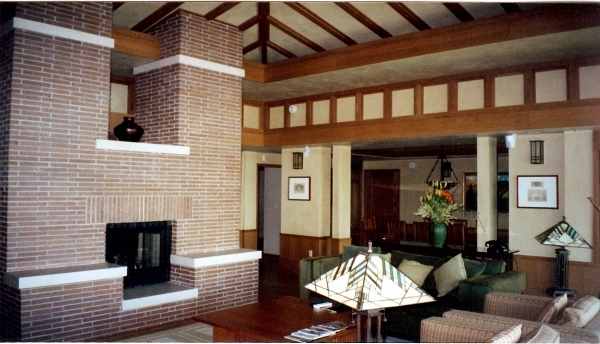 Wright believed that the fireplace was the heart of the architecture of a home and the communal place for family unity. He most often used brick and stone to create these architectural focal points. Based on many of his early designs, the fireplace in this suite upholds the similar tradition with the inclusion of benches built on either side. F.L. Wright fans will also notice that the ceiling beam work is similar to those designed for his personal studio and the Coonley House, both in Illinois. The furniture is also in the same style. You can’t help but notice the repetition of the windows’ Tree of Life pattern on the stained glass table lamps. The furniture is styled in the theme the pieces found in Wright’s Illinois homes, with a few modifications. The sofa is also a queen bed. 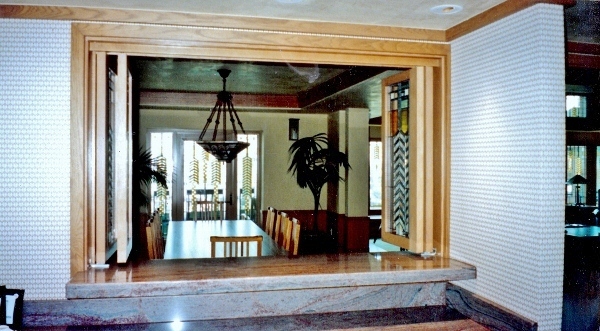 Looking in the background, you can see a private dining area for eight guests, just off of the east wall of the living room, as well as the doorway to the optional, connecting second bedroom with two queen beds. If you walk into the butler’s entrance at the northeast corner of the room, you get a much better view of the dining room. This small staging/bar area is used for parties and meeting catering – helpful counter space for trays of food from room service. The additional entrance here is helpful for the catering staff to assist in food delivery. I don’t know what possessed me that I didn’t think to photograph the master bedroom or the connecting second bedroom. On thinking more, it was probably because they weren’t so terribly different from the rest of the standard King and double queen rooms in the hotel. What I absolutely had to photograph was the master bath tub. The west wall of the room hosts the access to the king bedroom and a spacious bathroom with a jacuzzi soaking tub. 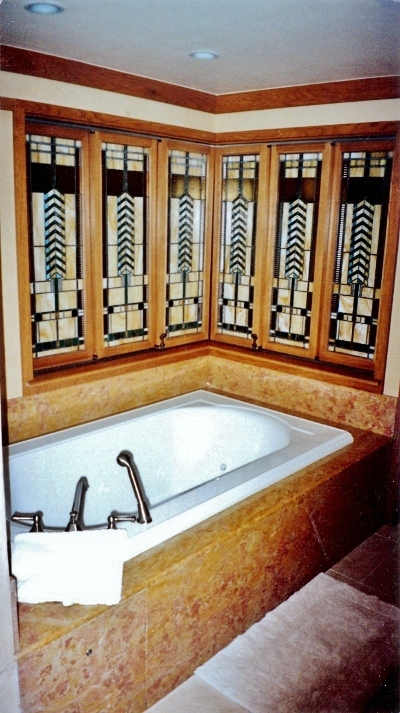 The early predecessor to the rooms at the Grand Californian Villas, each panel of the movable privacy screen hosts another stained glass interpretation of the Tree of Life theme. The panels open to the king bedroom and that spectacular view of the pools and Disney California Adventure. Looking back, I wish I had gotten the chance to take more photos, but we didn’t have as much time in the room as we would have liked, as they were getting ready for a VIP to check in. When we toured the room in 2001, the nightly cost for the suite was around $3,000 and they said the guests checking in that night were staying for a week! I haven’t asked the current cost, but I imagine inflation has upped that a bit. No matter what the charge, I’m certain that the ambiance of this suite adds so much to a Disneyland Resort vacation.